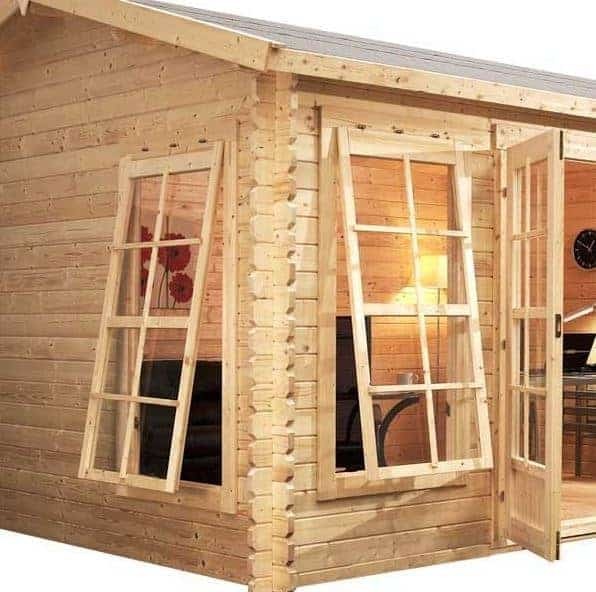 The 4.5m x 3.5m Home Office Director Log Cabin makes working from home a joy! In this incredible log cabin you can create the home office of your dreams; making you more productive and giving you a comfortable and inspiring workplace environment. This incredibly spacious home office building has plenty of features that make it robust and solid. Tongue and groove cladding ensures that you have a building that is resistant to rot and the wear and tear of the seasons. The 4.5m x 3.5m Home Office Director also comes with a cylindrical lock construct, so you are able to keep your home office safe and secure, an important consideration when you think about the equipment you’ll be using. 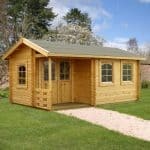 The log cabin has FSC timber, and a 10 year guarantee for the building. With multiple windows and fully glazed doors, the home office will have an incredibly light and airy feel, making it the optimum working environment; there are also wonderful views out to the garden to inspire. The double doors are lockable, giving you peace of mind that both the contents and your important documents are completely secure once the work day has ended. Buying a home office for your garden is a big decision, particularly given the size and price of the item involved. 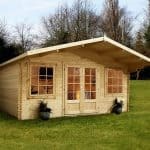 In this section we have a look in further detail at the different features of the log cabin, how it can be used in different capacities and how it might fit into your lifestyle to provide the perfect garden building you have been searching for. Exterior: The log cabin is constructed from 34mm tongue and groove cladding that gives the building a traditional and charming exterior. 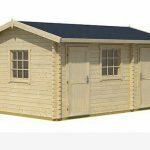 The timber blends into its natural surroundings well in its original timber aesthetic, however, there is the option to paint the exterior to give the cabin a fresh new look or to match existing garden buildings or furniture. Interior: The 15’ x 12’ interior gives an incredible space in which to work whilst enjoying the garden scenery. The cabin gives a blank canvas in which to create the home office of your dreams, and one that meets your particular requirements, allowing you to organise the space as you wish. It is worth noting that the log cabin could also be used as a summer house, personal gym, hobby room or similarly use. Windows & Doors: The fully glazed, floor to ceiling windows and double doors run along the entire front of the home office, as well as partially at the sides. This means that the interior is flooded with light during daytime hours and you can enjoy wonderful views out to the garden whilst you work. There is the option to have the log cabin single or double glazed, this can be selected during the purchase process. Security: The cabin’s double doors are lockable and come complete with a lock and key, giving you peace of mind that the contents are completely secure whilst not in use. 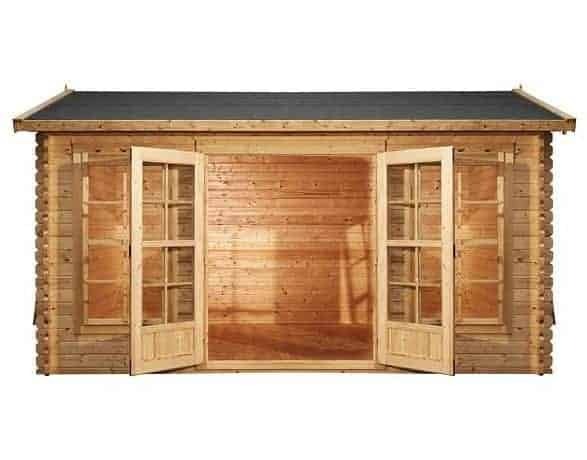 4.5m x 3.5m Home Office Director Log Cabin: How easy to build? At 15’x12’ the log cabin is certainly a large garden building; one that you may take one look at and feel overwhelmed by the thought of the assembly process. Please note that a professional home installation service is available at an additional cost – which may interest those with limited DIY experience or those who simply don’t have the time for assembly. For self-assembly, the log cabin will arrive flat-packed in a package containing all of the timber panels, roofing, fixtures and fittings required for easy assembly. With the comprehensive instructions, assembly is straight-forward for those with even basic DIY experience and we expect that this cabin could be built within a day. Assembly will require at least two people, for both safety reasons and due to the size and weight of the parts. 4.5m x 3.5m Home Office Director Log Cabin: What is the overall quality like? The Director Log Cabin gives a great first impression; 34mm tongue and groove cladding and floor to ceiling windows make this amazing garden building fell like a dream. 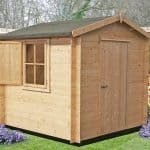 Constructed from high quality, FSC timber, the cabin comes complete with a 10-year anti-rot guarantee from the manufacturer. This is on the provision that the building is well-maintained throughout its lifetime and has a timber preservative applied annually. The exterior is weather-resistant and will protect the interior from the elements all year round. The roof is made up of 19mm tongue and groove cladding covered with heavy duty mineral felt material for extra protection and durability. This particular model comes with 4mm single glazing; however, other glazing options are available as optional extras during the purchase process. 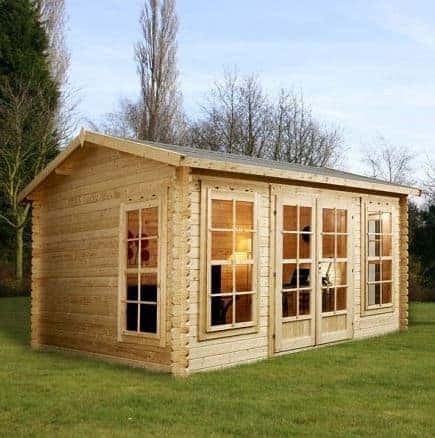 Whether you are self-employed or just want a home office for occasional use, the superb 4.5m x 3.5m Home Office Director Log Cabin will give you a work environment in which you can’t fail to be productive! With floor to ceiling glazing along the entire front and sides of the log cabin, and views aplenty out to the garden, this is an office with a difference. This amazing garden building is worth every penny and could alternatively be used as a summer house.